There are a number of design and installation considerations when incorporating tiles into your small bathroom. Sidestep costly mistakes with these best practices, and, in turn, you'll find your bath looking more attractive and spacious. Thanks to the abundance of design and colors on the market today, choosing tiles that can visually expand a small space is easier than ever. Whether you select mosaics, large tiles, or a combination of sizes, keep in mind tile installation is usually permanent and can be costly in terms of both materials and labor. Choosing the correct tile for your small bathroom requires careful planning. 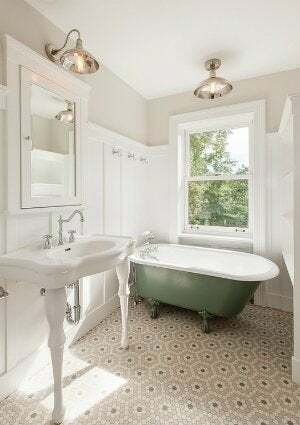 As projects go, tiling a small bath isn’t exactly a quick and easy task, but if you are patient and diligent it can be a very rewarding experience. Before you invest in any materials, consider the following guidelines to help avoid an expensive mistake. Accurate measurements are a crucial first step in any tile project, but especially in the likely awkward layout that is your cramped bathroom. Any mistakes here can lead to conspicuous design problems. When calculating the amount of tile needed for floors or walls, multiply the length of the area you are covering by the width to find the square footage. Then you’ll want to add extra footage for waste. The exact amount of waste will depend on your tile size and the configuration, but 15 percent (up to 20 percent, in cases where the space has lots of corners or a diagonal layout) of the calculated square footage is a safe bet. Double-check your numbers before ordering. Why invest in so much tile as part of the waste factor? Remember: Running out of materials on any job can be very frustrating. Having to stop mid-job to regroup is bad enough, but—in an even worse case scenario—you might find that the store is out of your particular tiles. Ordering tiles 15 to 20 percent more than you expect to use will help ensure against miscalculations, breakages, and cutting odd sizes to fit the space. It’s also a good idea to have spare tiles in reserve should any tiles become cracked or damaged in the future. Check to see if your retailer will allow refunds for unused tiles or unopened boxes, or start dreaming up projects to make with the spares. In addition to injecting your bathroom with the look and feel of a professional spa, covering your space in mosaic tiles also visually expand limited square footage in the bathroom. One-inch tiles on walls, floors, shower enclosures, and even ceilings fool the brain into thinking the space is larger just because there are so many round or square tiles lined up. When choosing mosaic tile from the wide variety of colors and styles on the market, consider glass. Glass mosaics will reflect light around the walls and ceiling, which in turn creates the illusion of a deeper, wider, and overall larger room. We don’t mean to suggest that you can’t fit large tiles into the scheme of your small bath. Quite the contrary! Just like small, 1-inch tiles, large tiles can actually make the small space appear larger. Here’s how it works: Our brain associates big tiles with a large space, so seeing them in a smaller setting tricks us it into thinking the room is larger than we know it to be. If you’re ready to adopt an extra-large tile treatment on your floors, consider, for additional impact, continuing them up the walls to the height of a chair rail. Tiling with several colors and bold patterns in a small bathroom can overwhelm the space and make it seem even more cramped than its actual size. Choosing a single light color for the floors and walls, however, makes the tiny room appear more spacious. If you prefer variety, select soft-hued colors that are a few shades lighter or darker than each other and consider smaller-scale design to keep with the size of the room. Be sure that the surface on which you are working is clean, smooth, and solid. Otherwise, soft floors cause tiles to crack or loosen and uneven walls allow moisture to get behind tiles causing them to loosen and fall off—not exactly what you want to see soon after completing a labor-intensive project. In addition to leveling any uneven surface, also be sure to always remove wallpaper from walls and sand the surface before applying tiles. 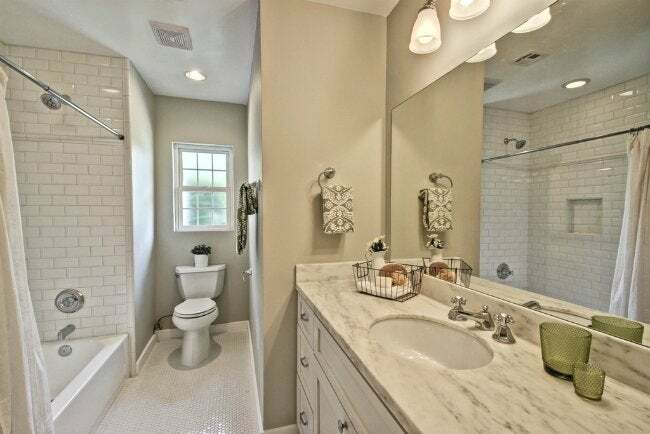 Here’s another optical illusion that can work in your favor: Tiles set in a diagonal pattern across the floor can help a small bathroom be perceived as larger than its actual size. This layout places emphasis on the length and width simultaneously. Intrigued? Just know that diagonal tile patterns require more planning, precise measuring, and cutting—especially around the perimeter of the room. Before starting, you’ll use graph paper to lay out a scaled diagram of your floor. After measuring, marking the floor, and cutting the tiles, installation is fairly straightforward. While glossy tiles and polished stone can look very luxurious in a bathroom, skip these materials for flooring. The sheen of these surfaces are slick to the touch—add a splash of water outside the tub or excess soap in the bottom of your shower, and they can be downright slippery. Fortunately for you, tiles are rated according to their slip resistance so that you know exactly what belongs where in order to minimize risk of falls. Check with your retailer before buying to make sure your choice is suited to the purpose.